Maximum Friction Reduction – For low cable pulling tension. Clean and Non-Staining – Minimizes clean-up time. Field-Friendly Application – Can be pumped, hand applied, or distributed by Front End Pack™ . Temperature Stable – No ruined lubricant from freeze/thaw or high-temperature exposure. High Cling Factor – Stays on cable jacket during application. * Polywater® J is not recommended for LSZH/LSHF and certain CSPE and CPE cable jackets. For these jacket types, Polywater® LZ is the recommended/approved product. Polywater® Lubricant J is a high-performance, clean, slow-drying, water-based gel lubricant. Lubricant J provides maximum tension reduction in all types of cable pulling. It is specially recommended for long pulls, multiple-bend pulls, and pulls in a hot environment. Lubricant J dries to form a thin lubricating film that retains its lubricity for months after use. 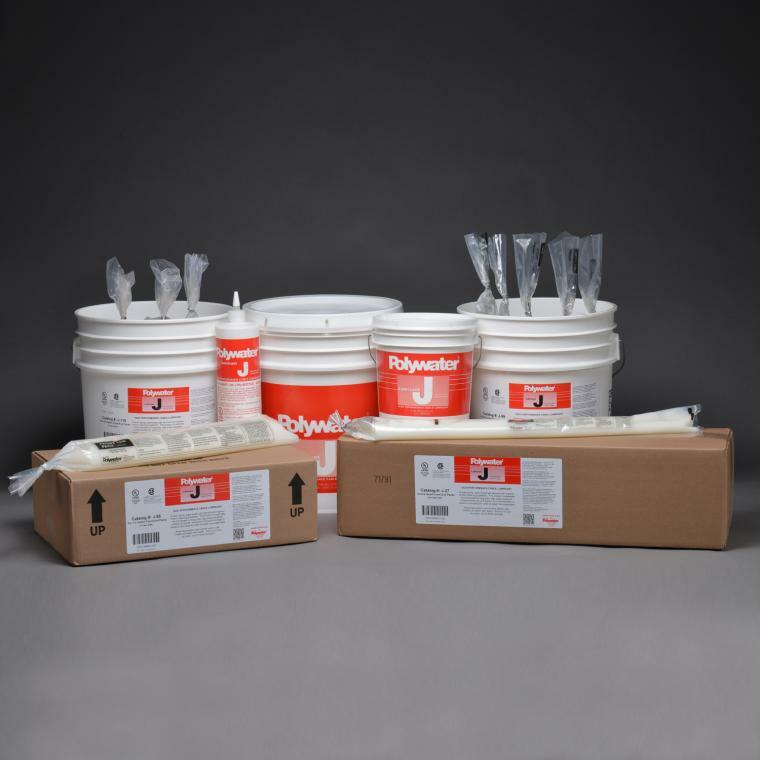 Polywater® Lubricant J is a specification-grade lubricant that does not promote flame propagation when used with fire-retardant cables and systems. It is harmless to humans, environmentally safe, compatible with common cable jacket materials, and can be easily applied by hand, by pump, or by use of the unique Polywater® Front End Pack™ System. Polywater® J comes in two grades: Regular Grade J and Winter Grade WJ (for cold weather use in temperatures as low as -20°F (-30°C)). A pourable version of Polywater® J (PJ) is also available (see sidebar). The Front End Pack™ is a conduit-sized polyethylene bag of lubricant that travels through the conduit on the winch line or pull rope, prelubricating the conduit ahead of the cable being pulled. Polywater® J can be pumped using the LP-D5 Drill-Powered Pump (see sidebar).